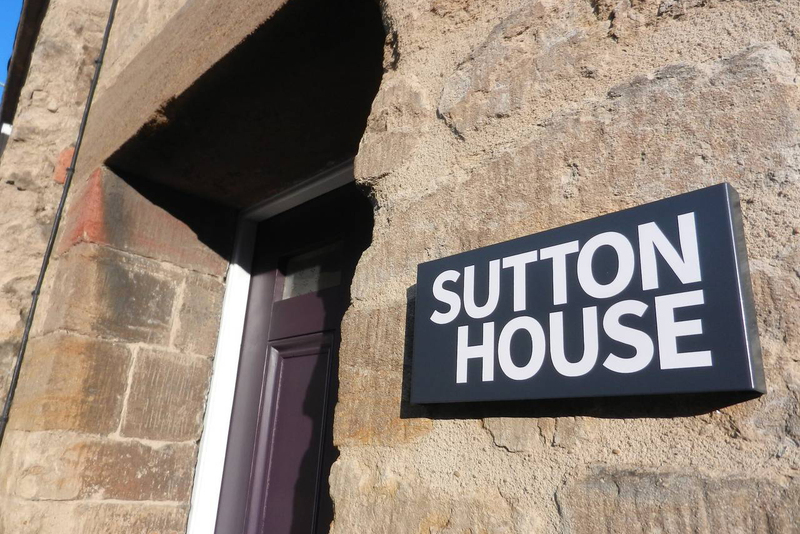 SUTTON HOUSE is a fully-restored Grade II* listed townhouse, right at the heart of the bustling market town of Crewkerne, Somerset. Not lived in for almost 50 years, it now provides an excellent base to discover the towns and countryside of Somerset, Devon and Dorset. Glastonbury Tor, Lyme Regis, the Jurassic Coast and Exeter are all less than an hour away. The house itself, with parts dating back to 1650, provides history alongside contemporary style. Environmentally-friendly materials have been used wherever possible. Traditional limework has been preserved, minimal-VOC paints have enhanced wood and plaster, and plastics have been kept to a minimum. Sutton House has central heating throughout and a wonderful wood burning stove – with free logs! Ideal for 4, might suit 6 but please ask first. Small pets are welcome, please let use know what you are bringing when you contact us. Entrance hall with original blue lias flagstones throughout leads on to the: front room with sash window, sofa and smart TV; middle room with wood burner and dining table for 4-6; and, the stairs (which are winding and narrow – as you would expect in a building this old). 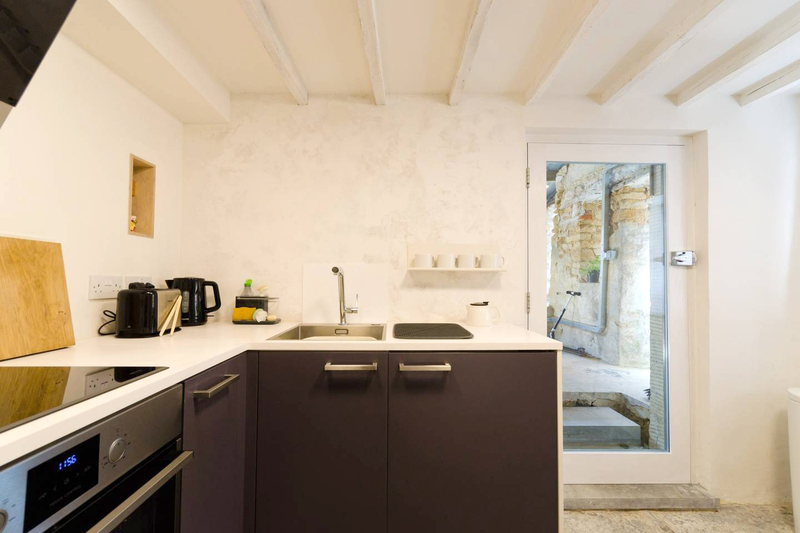 Linked to the middle room is the kitchen with new, high-spec appliances and one of the strangest windows you’ll see, and beyond the kitchen is a garden room – a large indoor-outdoor space – and courtyard garden, fully enclosed, with blue lias paving. 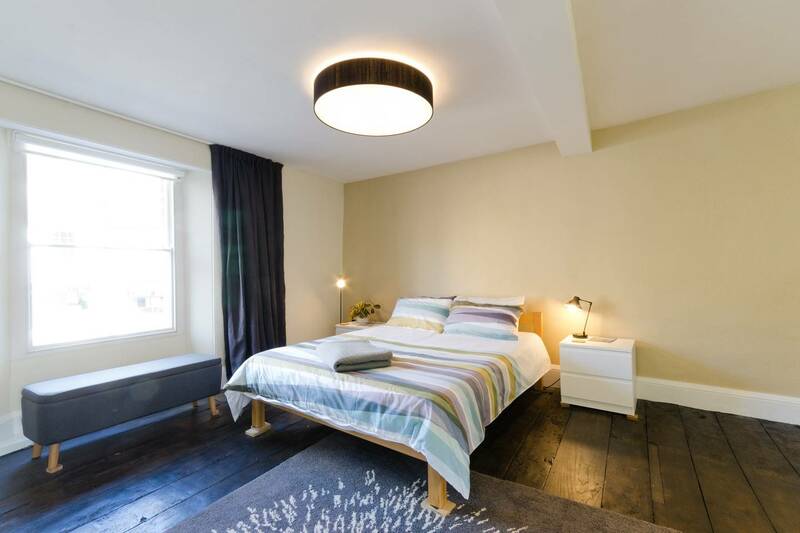 Main bedroom is large, with double bed, dressing table, restored elm floor boards and Georgian sash window. 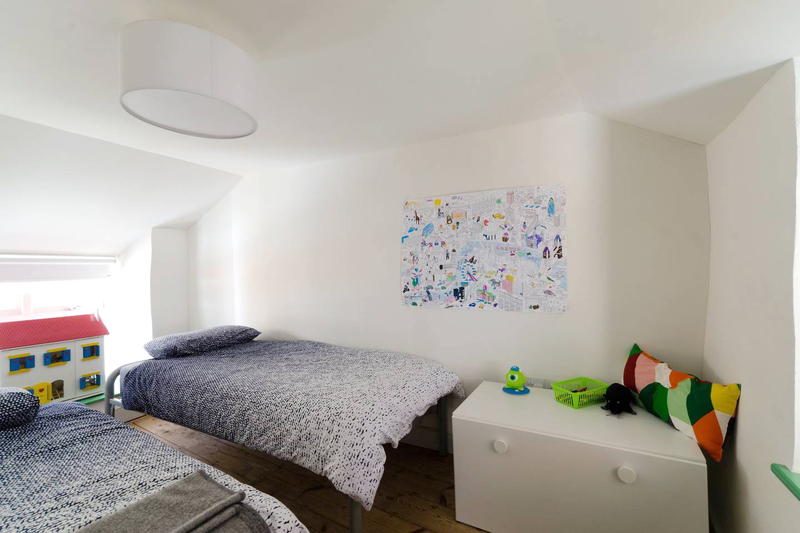 The second bedroom, tucked away at the back of the house with a single bed and a trundle stored underneath, is ideal for children. A shower room provides a large contemporary shower and superb infrared heating. We have a permit for guests, who can park for free in town centre carparks. 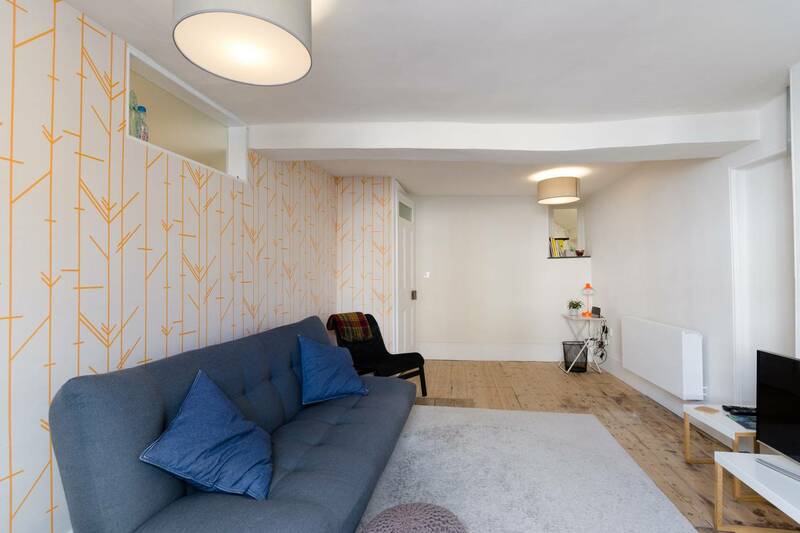 The closest is less than 2 minutes walk from Sutton House. From £80 (€92) per night. Minimum 3 nights. You can see our calendar and book online at Airbnb or Holiday Lettings. Alternatively please contact us directly using the details below.